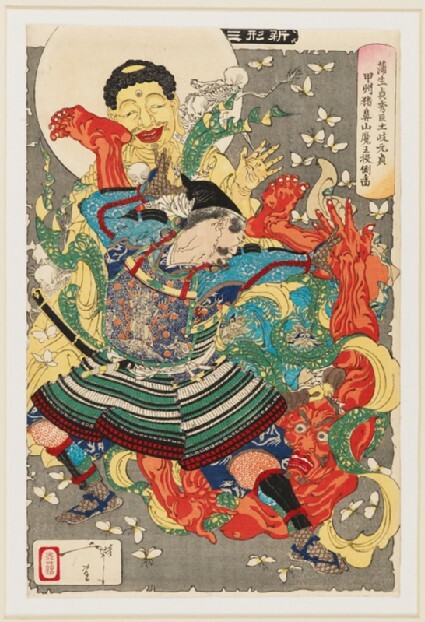 It is not known where Yoshitoshi found the story for this print, but Yoshitoshi’s series ‘One Hundred Ghost Stories of China and Japan’ contains a similar design with a short explanation, although the names used are slightly different. In this explanation, a certain Gamō Ujiue sets up camp near Mount Inohana in Kai Province. One of his officers, Toki Daishiro, hears of strange happenings at an old temple in the neighbourhood. 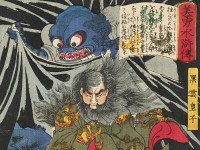 Investigating the temple late at night, he sees many strange phantoms, including a ferocious-looking temple guardian. Toki grapples with this figure and throws it to the ground, whereupon all the apparitions vanish.